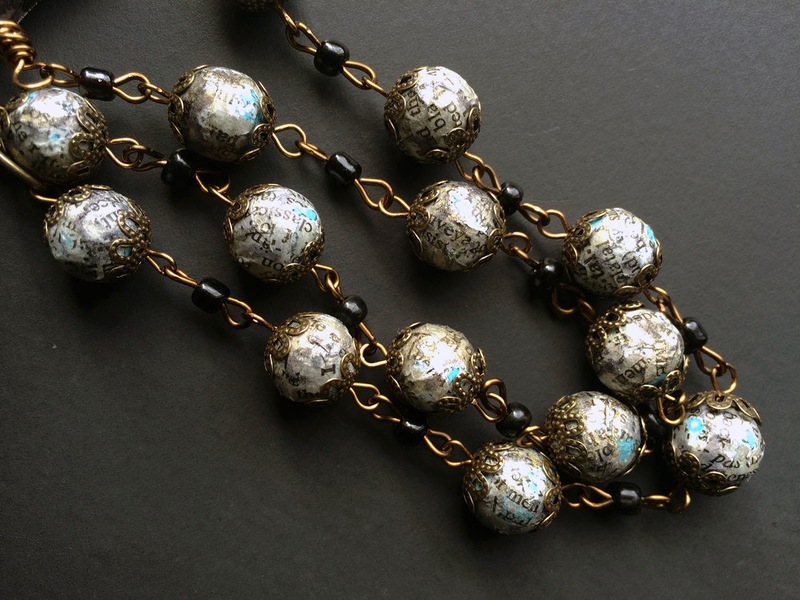 Last week I revealed what I made with the Art Jewelry Elements Component of the Month and promised a look at how I created the text beads and the altered fringe. 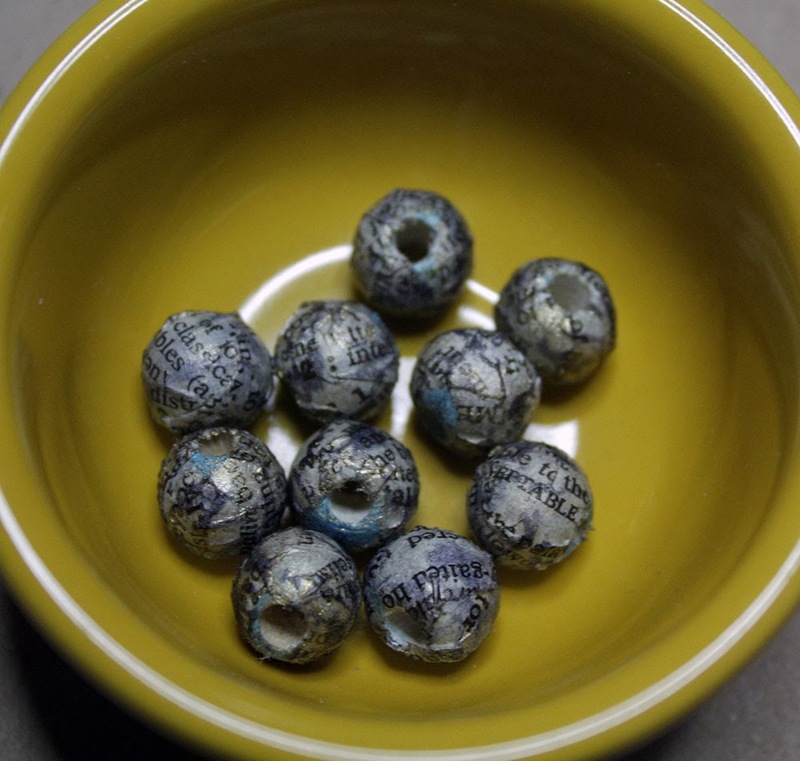 The text beads are simply decoupaged wood beads with some additional alterations. 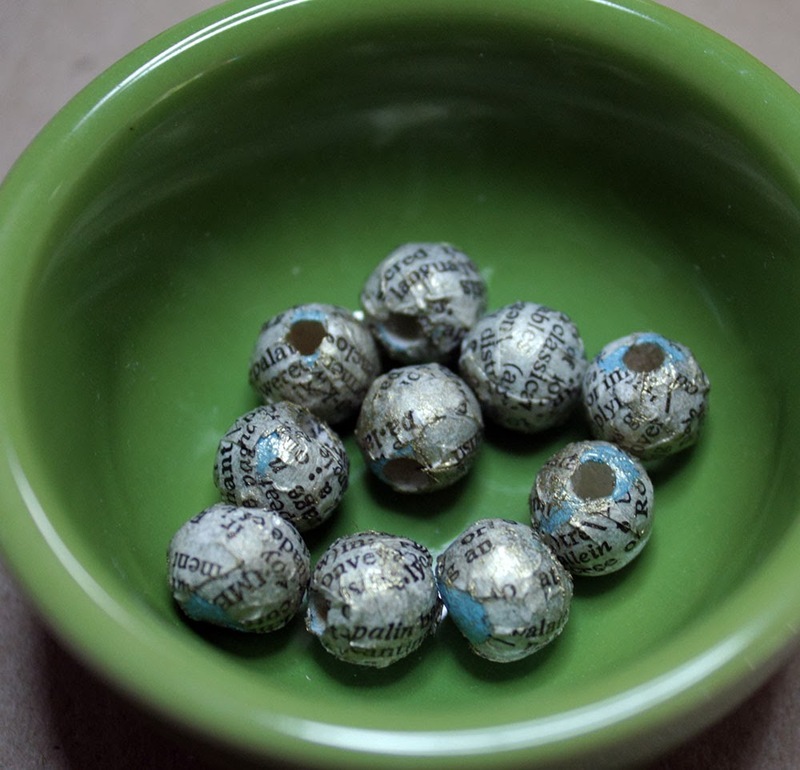 Here's a reminder of what the finished beads looked like. 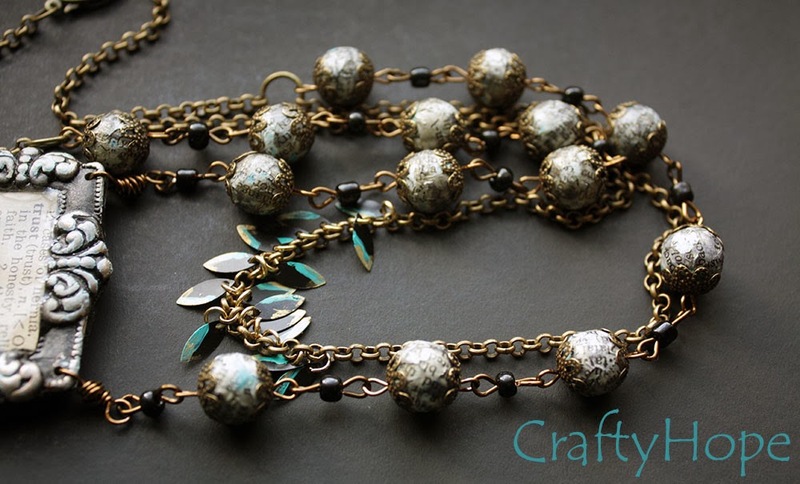 To make these, simply start with some wood beads of your choice and thread them onto a wooden skewer. 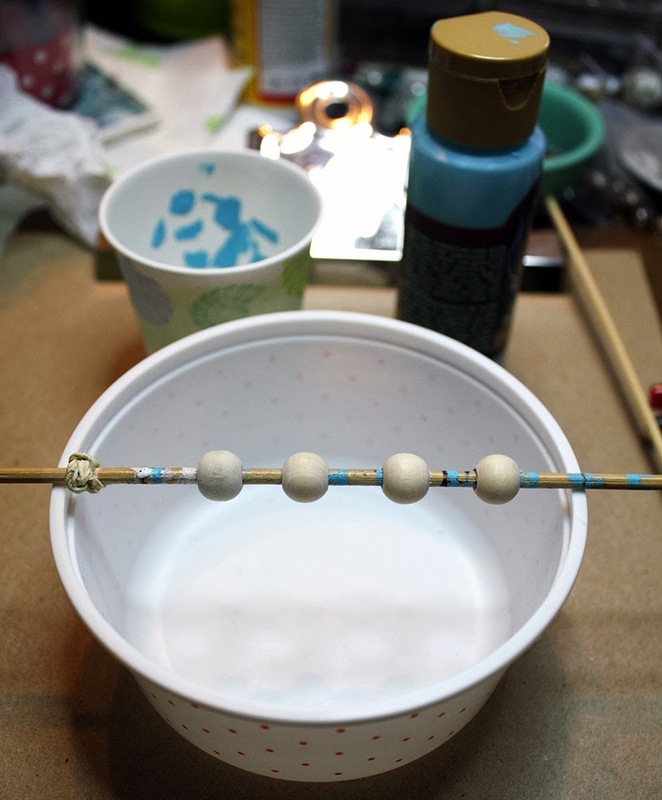 In addition for this first step, you will need acrylic paint, a paintbrush, something to put the paint on/in, and a small bowl to rest the skewer on while the paint/glue dries. 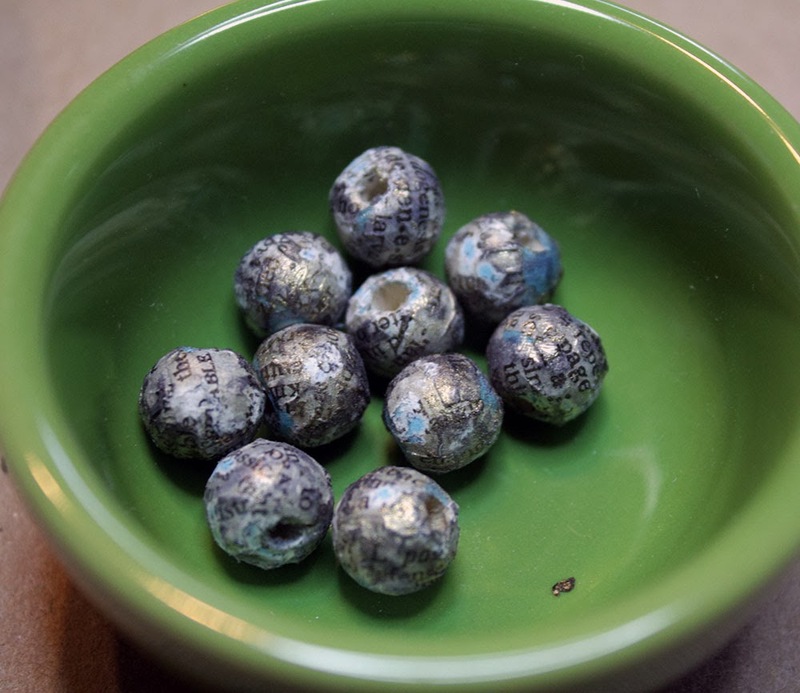 Notes: I prefer unfinished wood beads if I can find them. Also, the wood skewer is just a basic kitchen one I bought at the grocery store. 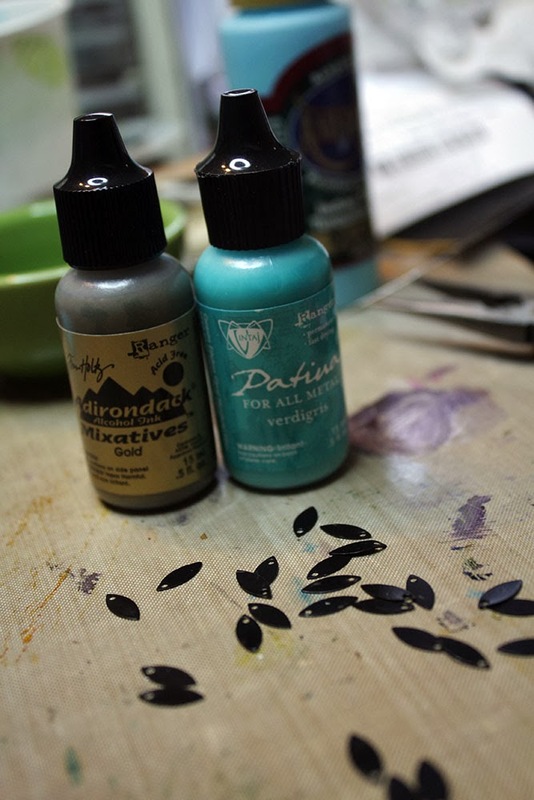 Cover your beads with a coat or two of your paint and allow it to dry. It shouldn't take the paint long to dry. While it is drying, pull out a page from an old dictionary (or other book of your choice) and tear it into small strips. Also, grab some gel medium (mod podge works fine too). 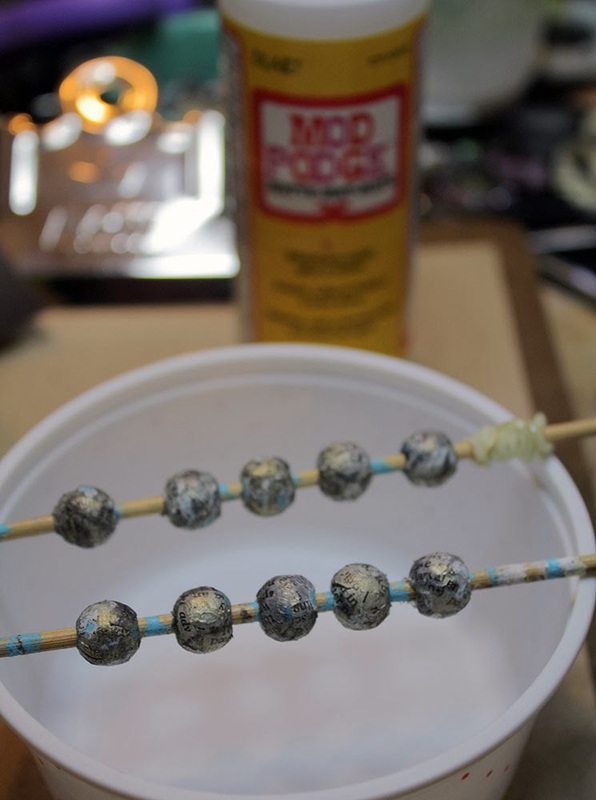 Working with one bead at a time, coat a bead with gel medium. 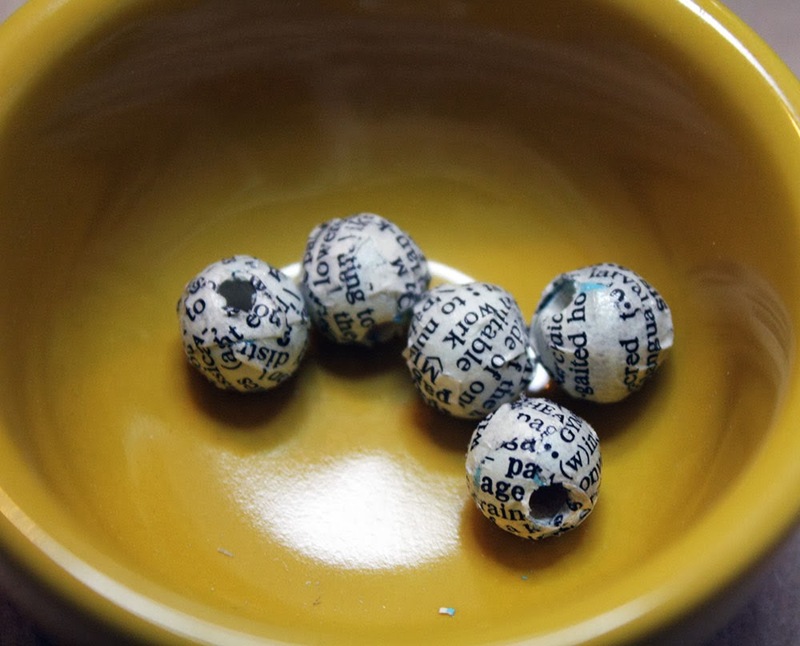 Quickly wrap a piece of your torn text around the sticky bead. 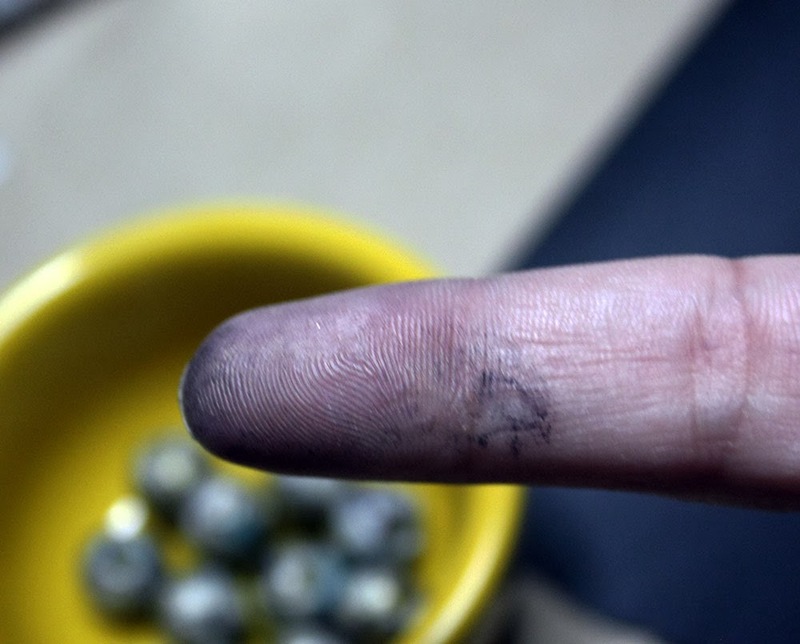 Don't worry if the paper overlaps itself or if there's not enough to cover the whole bead. 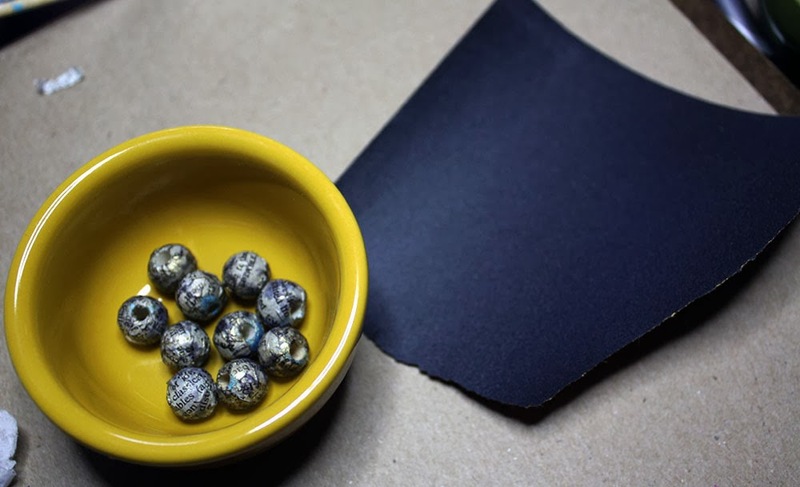 For large sections of exposed bead, use tiny bits of paper to cover. Again, don't worry if the paper overlaps. It's also okay if some of the paint color peeks out a bit. Repeat this with all your beads. 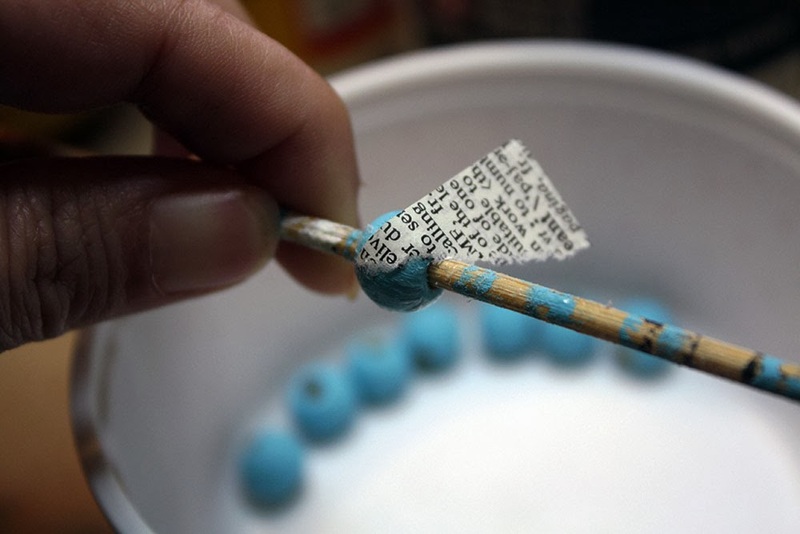 Once each bead is covered with text, coat them with a layer of the gel medium to seal the paper. Now, get out a gold stamp pad and a black stamp pad. Note: I used what I had on hand. I could have used StayzOn black, but I was afraid that wouldn't rub off the way I wanted it to. 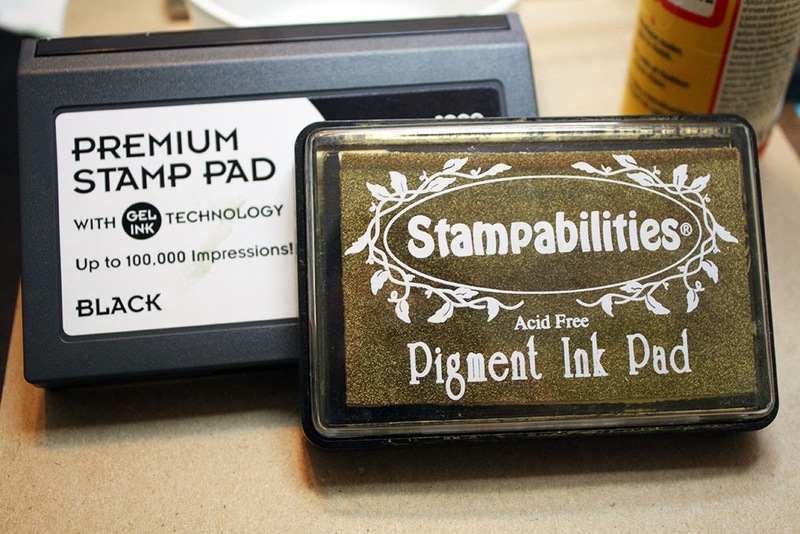 Place a bead on the gold stamp pad and roll it around with your finger so that some of the color transfers to the bead. Note: depending on the type of stamp pad you use, you'll have to apply different amounts of pressure to get the coverage you want. 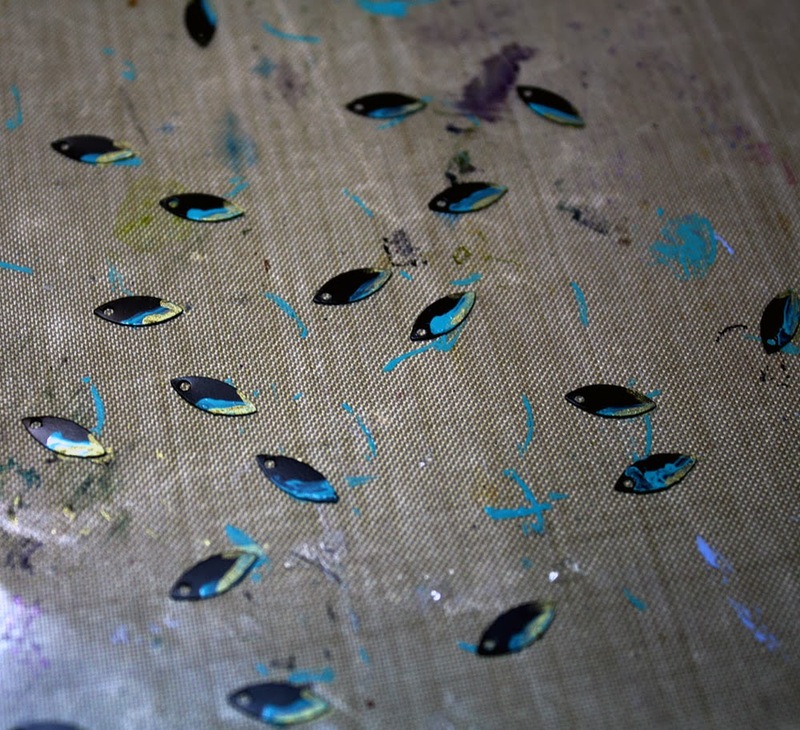 Immediately after rolling each bead, wipe it with a paper towel to remove any excess ink. 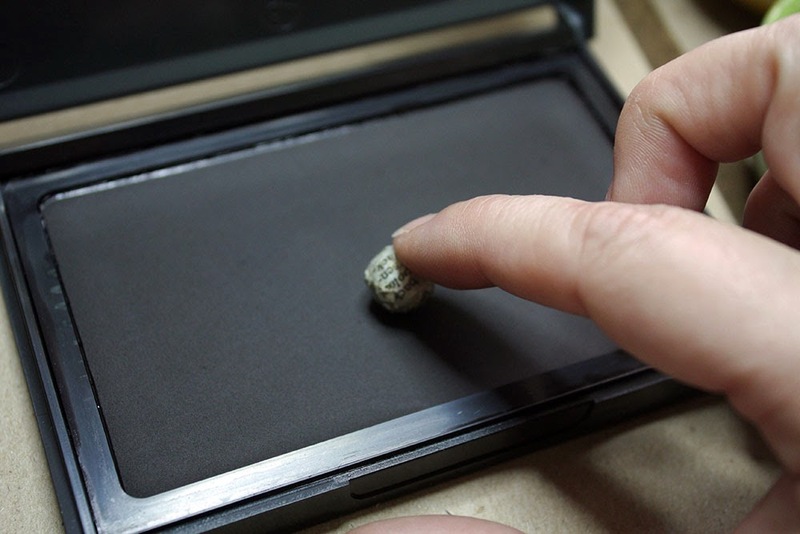 Next, roll each of your beads on the black stamp pad. 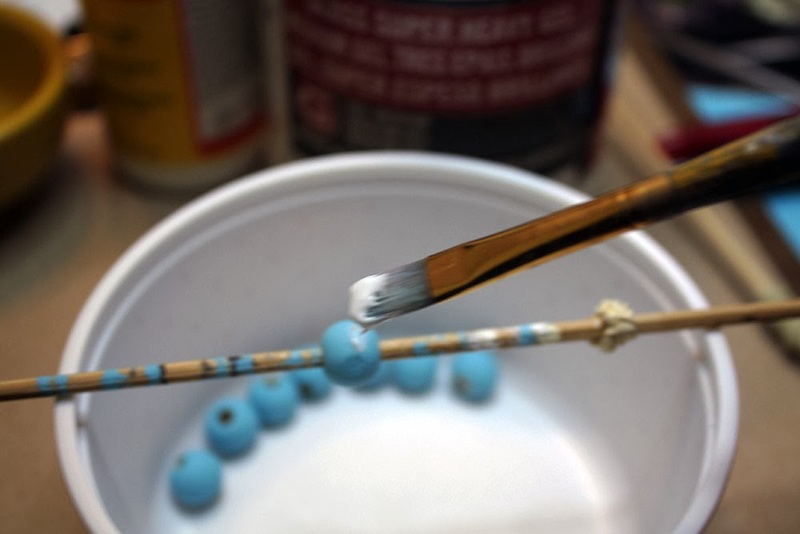 Again, immediately wipe each of the beads to remove excess (and help smear the color a little). 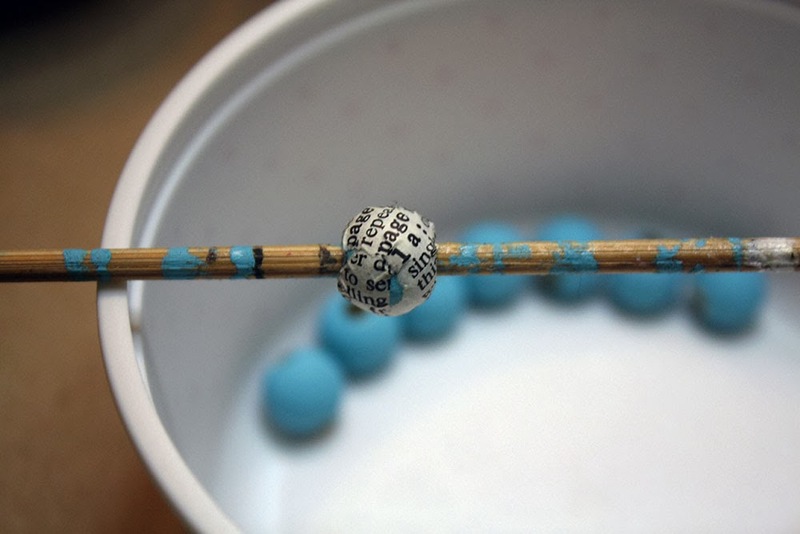 Set the beads aside to dry for a few minutes. Does your index finger now look like this? Good, you're doing it right then. Pull out some fine grit sandpaper. Note: I think this was some 400 grit wet/dry sandpaper. I tend to just tear strips off sheets of sandpaper as I need them. It keeps me from using a whole sheet when I only need a little. 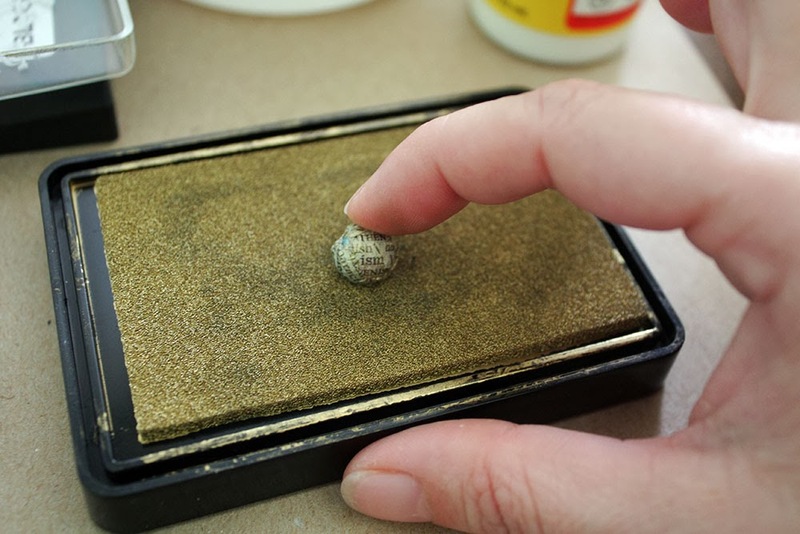 Feel around your bead and lightly sand off the larger bumpy, lumpy sections...the ones where the paper overlapped. This will likely expose more of the paint so don't go overboard with it unless you want more of the color showing. Also, try not to rub through the paint either. 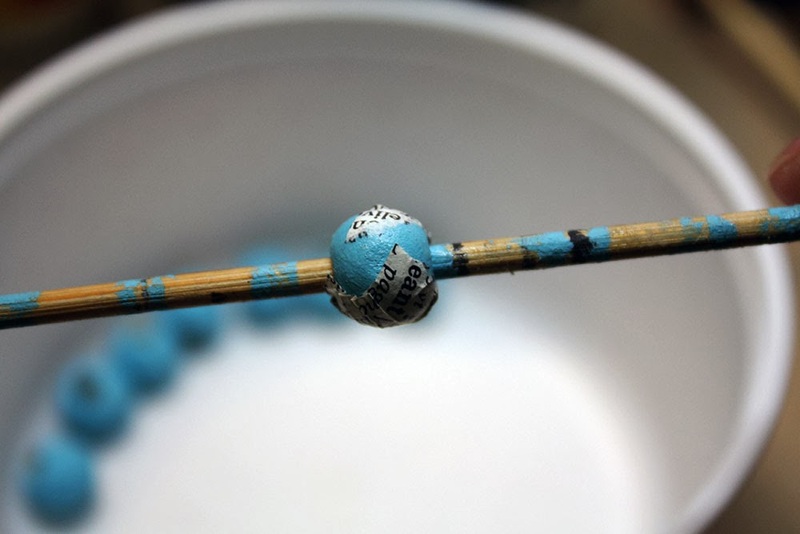 Put all of your beads back on your skewer(s) and coat them with Mod Podge matte. Note: I used the matte because it ensured the beads didn't get too shiny. The gold ink gave it plenty of shine. Let your beads dry and they are done. See. . .easy peasy! 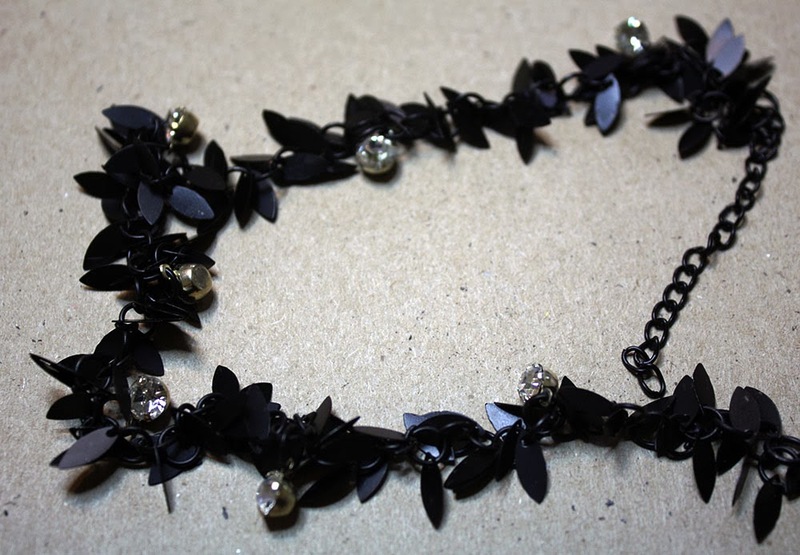 I also created some altered fringe for the necklace. This was even easier. The fringe bits were taken from a metal chain found at Hobby Lobby. With a very thin paintbrush, paint on Ranger Vintaj Patina in verdigris and Ranger alcohol ink Mixatives in gold. Note: I simply did one edge on each side with the verdigris and then just overlapped that a little with the gold. I had a great time playing with my supplies and getting to create with a beautiful focal from Jenny! I hope these instructions prompt you to play with your supplies some more too. Don't hesitate to ask me a question if any of my instructions aren't clear or if I left out something. I'm so glad you like it! Have fun!! Great tutorial! I love how the paint color peeks through and the ink stamp step really gives it that finishing touch. I love your word beads, Hope! What a great idea. I have some wooden beads, I think I"ll have to play! The fringe is great too. Your tutorial is wonderful. Thanks for sharing it.